Part of the Glitter Galore collection, this personalized guest book will make your guest book table sparkle. 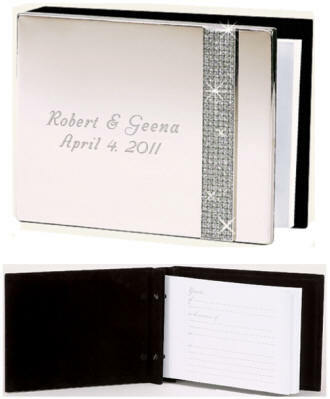 The guest book cover is a non tarnish silver with a band of sparkling crystals along the right side. We will personalize the front of this guest book with the couple's names and event date. Inside the cover there is a page for entering the names of the host, the reason for the occasion, the date, and the location. The subsequent pages contain about 40 ruled pages for guest names.